Join us at our Quakertown Branch for Discovery Studio, a new, interactive, community space for adults and children, with exhibits that will change monthly. 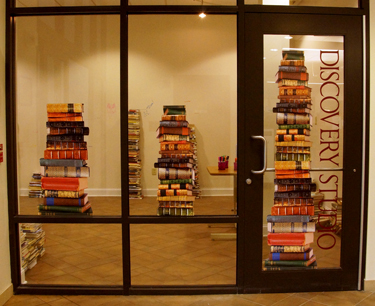 Discovery Studio opens on September 5 with “How Many Stories Tall?” If you have ever wondered how many books it would take to build a stack as tall as you, here’s your chance to find out. To participate, take a marker, and write your height on the Studio wall. Yes, you’re allowed to draw on the wall in this exhibit — in fact, we encourage it! Then, grab some books from our stockpile and build your stack until it is as tall as you are. Don’t forget to count the books and write that on the wall, next to your name. You can even leave us a drawing if you’d like. Most of all, have fun! If you take photos, share them on social media using #DiscoveryStudio, so we can find them. Discovery Studio is open during normal branch hours. “How Many Stories Tall?” is open until September 23. October’s exhibit, “Lego Wall,” will open on October 2. Next Post: New: Sensory Storytimes!